To order, template or design... you do not need an account. Our very special system avoids the clutter of holding an account with you, lost passwords or your staff accessing details that may not be applicable. You do not need a login to access any features of Signs Banners Online. This means that you can rapidly order 'wholesale' recognizing that login's are not needed and that we remain a silent wholesale service. Via your 'MyPage' or inbox you have full management control. 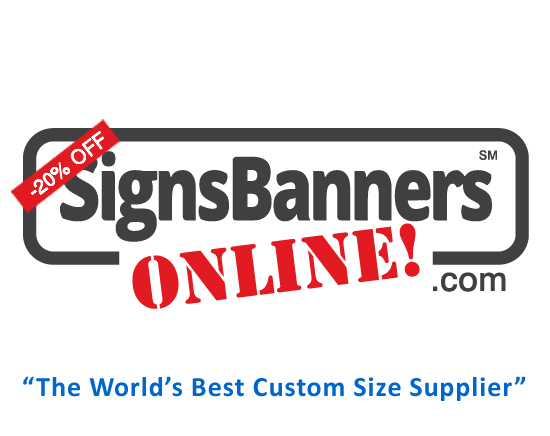 "It's the perfect way to order signs and banners online". Select prices, options and choices via the Calculator. Clicking Add Items to Quote begins your Session. As you move through the order, SBO's intelligent system allows you to manage all facets of your order. Your security is priority. Sessions are unique and can not be hacked. All payments are via PayPal encryption. A Session holds information about adding items to the cart, and is available DURING YOUR TIME on Signs Banners Online ONCE, then it expires. This offers you security and privacy as a wholesale buyer knowing that when you leave the SBO site, data is cleared. SBO allocate UNIQUE sessions everytime you visit protecting your anonimity. Are you sure you want to delete this Line Item? BOTH your Cart and Upload will be cleared and you will need to + Add a new Line Item to proceed. Deleting last item from: CART or UPLOAD means you'll need to + Add a new Line Item to proceed. Deleting last item from CART or UPLOAD also means you'll not be able to retrieve pending orders via your email links or 'MyPage'. Effectively this clears your cart everywhere. Deleting last item from CART or UPLOAD also means clearing your discounts. AND gives you access to the order details via your 'MyPage' or inbox. Your access to each paid order 'MyPage' does not expire. RESTART Calculator WHEN YOU WANT TO CHANGE CUSTOMERS... you will need to restart the calculator so that a new IDENTIFIER is associated with your new shipping label or customer. This feature is very handy for designers who repeatedly process daily orders for different clients, locations and parcels. Retrieval of Job Tickets = YES If required by you, you can retrieve a job receipt via your 'MyPage', however for your security, some information is removed as re-order is not possible. Every order is a new order. Retrieval of Artwork = NO Our systems delete art files after Finalize concludes. Should you wish to 're-order, re-print, retreive etc it is not available. Any repeat, re-order etc is required to be a new order. IMPORTANT NOTE: We consider you are the originator of the artwork so we do not store it post order. Note: Also, After the payment step is completed you are given a unique page called 'MyPage' that you can continue to track various stages of your order. Checkout as a PayPal Guest with credit card OR checkout with your PayPal account. When you order... a UNIQUE IDENTIFIER session is allocated to your order from start to finish. The session identifier expires if you a) close your browser, b) complete your order, c) abandon your enquiries.